As most of you know by now Spanish food is something we write about alot. Today is no exception! 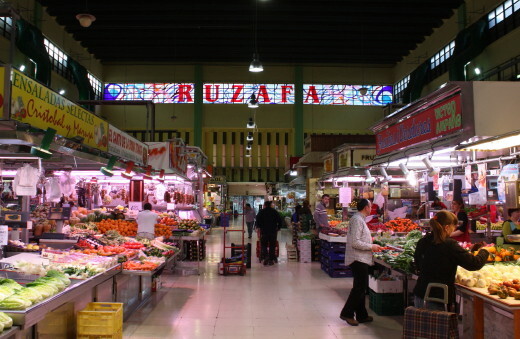 One of our favourite places in Valencia city to spend time in, is the Central Market. However, over the years it has transformed quite a bit. Pure economics have dictated that many stalls now cater to the increasing number of tourists who visit the market. 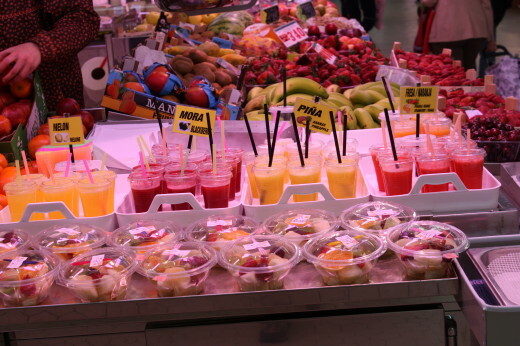 They sell cut and portioned fruit or smoothies to the hordes who literally invade the market from their cruise ships that dock in Valencia’s port. Whilst this is good for some it is terrible for others. 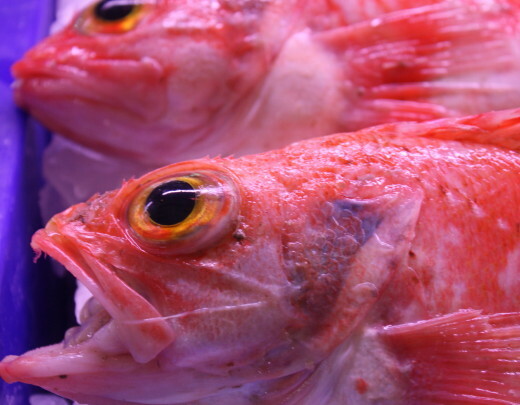 The fishmongers look on forlornly as people buy saffron,smoothies and ham and in their ‘fish area’ just take photos. No one buys fish to take back onto the boat. So to get away from the hordes all you need to do is go to one of the other fifteen or so covered markets that there are in Valencia. Yes,fifteen so lots of choice! Amazing when you think about it.For example, Ruzafa market is a lovely market that caters to the neighbourhood that corresponds to the same name. It is in fact Julia’s part of the city where she grew up and it is where her mother has bought fresh produce for the last fifty-five years, so she knows nearly all the stallholders and has an expert eye for quality and a good buy. 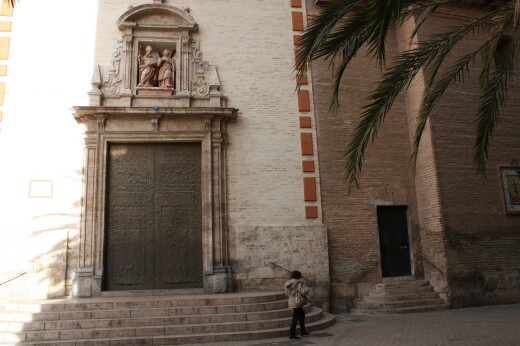 Ruzafa is one of the old parts of Valencia and its name supposedly means garden in Arabic. It has lots of interesting 19th and 20th century buildings and the area actually dates back to Moorish times when it was an estate-like park(hence the name) made for one of the Moorish princes(the son of Abderraman I). After the Christian reconquest the park was turned into fields for agriculture and remained the same for centuries. Nowadays, Ruzafa is part of the centre of the city and is famous for its passion for Fallas(the springtime fiestas celebrated in March). Some of the more intrepid tourists make it to this market but it continues to be an authentic market that sells 98% of it’s product to the people in the barrio(neighbourhood). So the atmosphere is more familiar and everyone knows everyone. On our last visit Julia chatted to stallholders and asked the banana lady if she is related to the gent who sold bananas at the same stall forty years ago and she said that she is his granddaughter. A true family business. 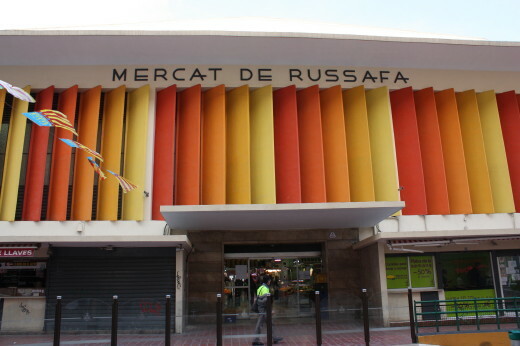 Ruzafa market is functional. It’s exterior is almost ugly with painted colours on each side to liven it up. Built in 1957 it was built in a place where they had a market for at least hundreds of years. 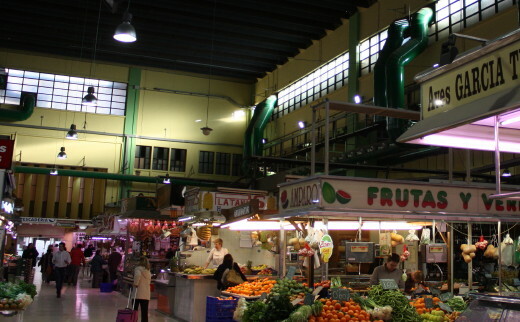 The interior is typical of Spanish covered markets, with wide aisles and good lighting and there is an attractive stained glass window at one end of the market.There is also a classic bar for breakfasts and almuerzos(mid morning snack). The atmosphere is very friendly in the market.Virtually every stallholder greets you with a genuine “Buenos dias” and a smile. The produce is first class and there is plenty of choice but as is typical in most Spanish markets it is the ‘in season’ local and national produce that takes the limelight. This is something which I have always liked in Spain. There is a season for everything and people look forward to each specific season rather than having melons twelve months of the year. This has changed over the years but fundamentally seasonal produce still rules!! The feel of the whole area is of a barrio(neighbourhood) and whereas before the surrounding area was a little run down over the last 6/7 years lots of new bars,restaurants and cafes have sprung up around the market in the surrounding streets making the whole area a magnet for young people and even people from outside the neighbourhood.Without doubt the crisis is putting a strain on businesses but there is a feeling of positiveness that radiates from the market. If you are ever in the area drop by and feel the vibe! You wont regret it. This entry was posted in Spain and tagged Food, food experience, fresh produce, gourmet food in spain, holidays Spain, local produce, local Spanish products, market, ruzafa, spanish culture, spanish food, Spanish life, Spanish Traditions, Travel, Valencia by Paddy Waller. Bookmark the permalink. Markets are one of my favorite haunts in Spain. I love the colors and the offerings, and am always sure to take guests to them. My picks in Seville are the Mercado de Feria and el de Triana, though I have yet to see the market in my neighborhood! Thanks Cat for your comments. Markets really do offer colour and character and still are part of the local culture. 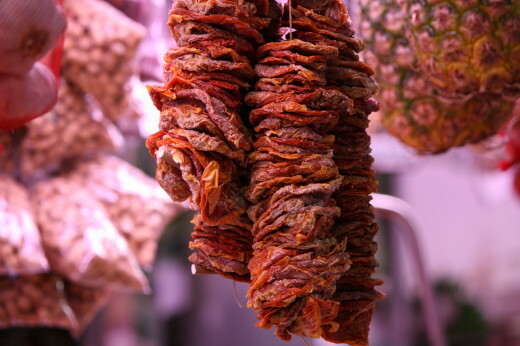 Markets and such are one of my favorite places to take pictures when I travel. I do buy local food while I am there (but not fish, don’t really like it), but the pictures are often more interesting. A market is often the center of life of an area and it is interesting to get away from the tourist runs and see what it is like at a daily level. I didn’t realize that Valencia had so many markets. We only saw two on our time there. The large tourist one and another smaller one that looked like it had been converted into a few cafes and a ham store downstairs. Thanks Andrew for your comments. The other market you went to was Mercado Colon which was closed as a food market in the 1980s which is a shame as the building is lovely and although the new abr,cafeterias and some deli bars are nice it is not the same. Yep Valencia has quite a number of markets next time you’re in town be sure to check out Ruzafa and its suroundings(fri or Sat best). Hi, I looked at this post because Valencia is high on our list to visit. Then I was glad to see your promotion of local and seasonal foods, a pet theme of mine. Most of all I was delighted at your friendly, personal touch. Thanks! Thanks Michael for dropping by and commenting.Glad you liked the post. If you ever come to Valencia let us know! It is worth it Maya and some of the bars near there are very nice too.Thanks for our comments! 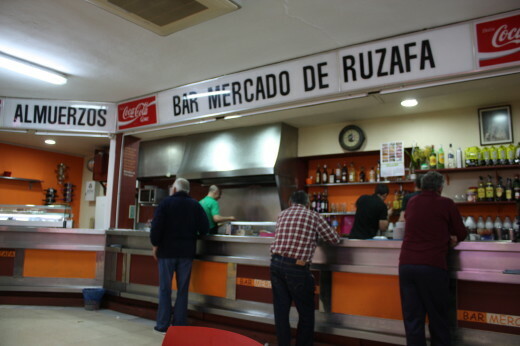 Another great post – love markets, love market bars – the mercado central in Cadiz is phenomenal if you’re ever there. A temple to fish & seafood! Kind of puts Mas Y Mas to shame. Haha! Mas y Mas does have its limitation! I love the Spanish markets, well, markets everywhere! I will be heading to Spain this summer, so will try to check out some of these in Valencia. Corinne .Thanks for dropping by and commenting…You’ll love the markets in Valencia. The Central Market is the best but you need to get there early to avoid the tourist rush off the cruise ships!